Police are trying to identify a woman who was found collapsed at a bus stop in Bristol. She was discovered at the junction of Dorchester Road and Filton Avenue in Horfield at noon on Wednesday. She may have suffered a heart attack. 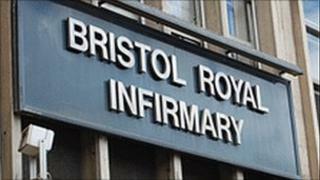 The woman, thought to be in her late 50s or early 60s, was taken to the Bristol Royal Infirmary where she is in a serious but stable condition. She is 5ft 9ins tall, with shoulder length dark brown, greying hair. Police said she was wearing a long black coat, a grey hooded top and grey tracksuit trousers over pink pyjamas and beige-coloured Ugg-style boots. The woman had a set of keys - one with a Bart Simpson print - and a key fob with photos of two cats. Anyone who recognises the woman from the description is urged to contact the hospital staff as they want to trace her relatives.